Pimples invariably pop up right in the center of your forehead on one of the most important days of your life. Prom night, wedding day, first week of work—they are sure to be there for you in all their many forms when you least need them. They appear when pores are blocked by dead skin cells, bacteria, and excess oil produced by the sebaceous gland. Since hormonal changes can alter how much oil is produced, the stress you feel on occasions like this can play a big role. Don’t give them more fuel: keep your cool and try these easy fixes. 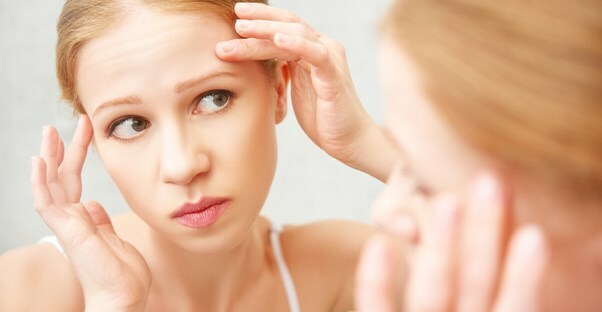 If you’re prone to acne anyway, increase your normal skincare regimen before you need your face to be clean and clear. Some skin responds well to just hot water, which expands the pores, releasing dirt and oil more easily. If you like mud masks and facial peels, don’t do it the night before—products like this often bring all the buried dirt to the surface and can actually make your acne worse instead of better for a few days. Placing a dab of rubbing alcohol or chlorahexadine on troublesome spots can clean out bacteria and dry up oil; rinse it with water if these dry out your skin, and use a clean towel to pat your face dry. Then, keep your hands away. Dirty towels and fingers only clog up pores even further. Witch Hazel is a natural antiseptic some people have a lot of good luck with for overnight clean-up jobs. However, it can lead to a slight burning sensation. Tea tree oil is another great antiseptic alternative. It has antibacterial and antifungal properties, which means it cleans and kills bacteria (among other things). Use just a tiny bit on a q-tip. Leave it on overnight and let it do its work. It’s gentle, so you don’t have to wash it off or worry about the burning that comes with some cleansers, and it smells wonderful. If you need an immediate fix, makeup may work for you. While covering your face can also block pores, occasional use with a thorough wash after its work is done can cover up those pesky pimples. You don’t have to put it everywhere—just a small dab on the spot, blended into the surrounding skin with a dab of powder on top to match your skin tone. There are also things similar to eyeliner in green and white, which are intended to negate the red tone of blemishes. You simply color over the spot with it and then apply concealer as usual. Some people swear by a whole host of different fruits, herbs, and vegetables to reduce acne to a memory. A honey and aspirin mask, peeled garlic clove, lemon juice, coconut oil, green tea, basil leaves boiled in water, calendula and castor oil, orange peel (pounded, not ground), nutmeg and cloves in milk, aloe vera, mint, cabbage leaves, egg whites, and apple cider vinegar are all famed for their wondrous abilities at soothing skin, cleansing pores, minimizing oil, and working miracles. Be careful, especially with things that have sugar in them: everyone’s skin responds differently. Dipping your face in honey may not work quite as well you’d think. Pop it. Doctors tell you not to, but once they reach a certain point, a little red spot is much less noticeable than a massive white pustule. Because if you don’t pop it, everyone else will want to do it for you.